WAN Network data can be optimized at various levels depending upon the network applications, protocols, topology and use-cases. So the amount of data you can optimize will depend on the strategy you choose to optimize. Network Packet level optimization: You can optimize your network data down to individual packets. This may be useful to optimize discrete network data such as VoIP and streaming networking applications. So depending on your network you can do frame level optimization in case if it is a Layer-2 switched network something like MPLS/VPLS scenarios. And in case it is a IP based routed networks you can do IP packet level optimization. So that the IP-header is intact where-as its other protocol headers and the payload is optimized. Hence packet level optimization suits for discrete network data and corresponding network applications. 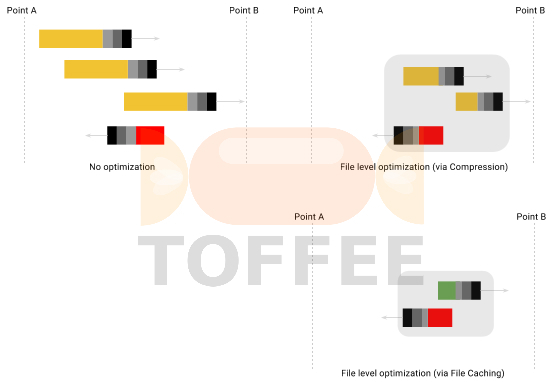 Session level optimization: Session level (or session based) optimization is suited for complete/full sessions bound by a network connection. For example TCP-connection. A remote MySQL or Oracle database access involves a TCP-connection (or a session). So in this case we are not talking about discrete packet level access (although a session will always comprise multiple packet transfers to and fro) and we are not talking about individual file-level access, instead it is a session-level bulk data transfers. In this case we can employ different network optimization strategy so that the entire session can be optimized. File level optimization: Last but not least a file-level optimization involves a typical file-download/file-upload scenario such as HTTP, FTP and so on. In this case in general even before sending across the wire we can do lossy (and lossless) compression of these files depending on its contents. But when it is being transferred across the network we can employ a network optimization strategy where an entire file transfer is optimized. We can also implement both above discussed techniques such as network packet-level and session-level to optimize file-level network data transfer. Some of the examples which comes in this category are CDN networks, HTTP Cache Proxy (such as Squid-Cache) and so on. Case study :: Dolby Servers in movie theaters: Movie theaters these days get digitized extremely high-quality movie files from film producers/distributor channels. Since these files are so huge they are transferred via high-speed wire (fibre-optic) networks. But in case if the movie theaters lack high-speed network connectivity then they ship these movie copies on a regular computer hard-drive. This is a good case study and use-case where file-level network data optimization can be deployed. In case if you are having a company and if you are looking for ways to optimize your network, performance tune-up and or building network optimization product(s) (which may or may not include porting/integrating TOFFEE on to your product), in that case I can offer my technical consultation services. If you are interested you can contact me for the same.